Dave does! Dave is a lovely monster from far far away that doesn’t understand why humans eat animals. Come with Dave and explore the fascinating world of chickens and their many talents. Written and illustrated by Carlos Patino. 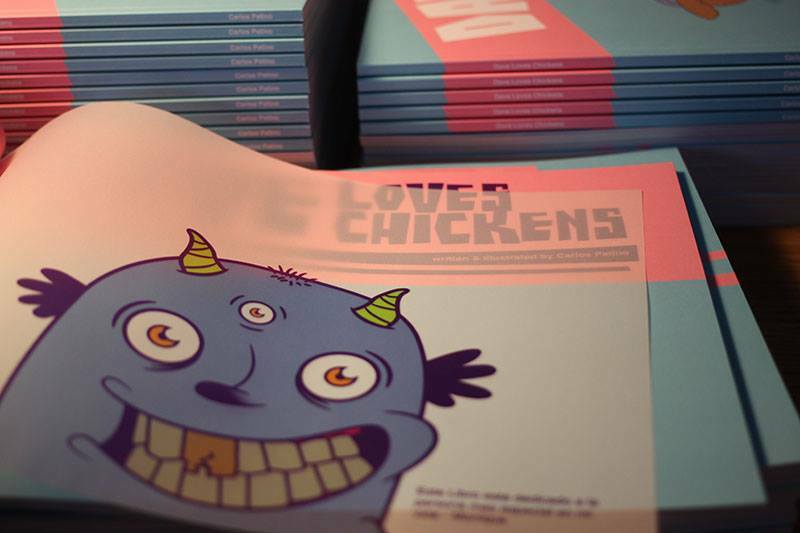 Order your copy of Dave Love’s Chickens today! Order now for 25% off! For orders in the UK, click here. Dave Loves Chickens is a new children’s book that plays on such an idea with charm and humor. 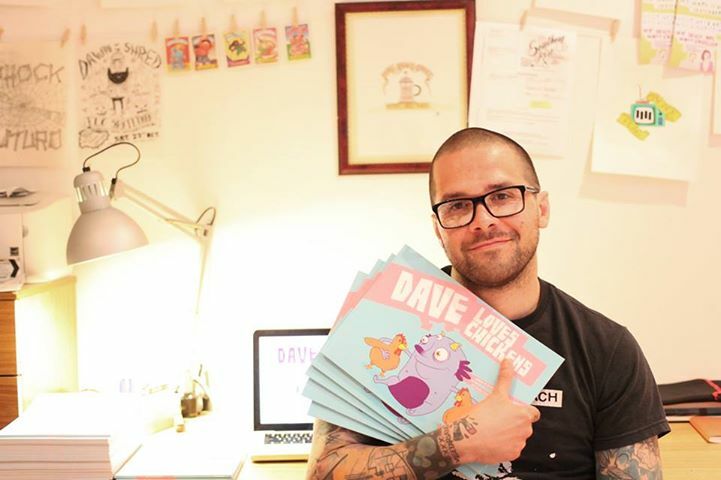 Author and illustrator Carlos Patiño introduces the reader to an alien whose name is so complicated that we are invited to “just call him Dave.” Visiting from a far-off planet, Dave is a large, three-eyed, purple monster who is brimming with love. He is also smart – he proudly removes the top of his head to show off his brain – and he would never dream of littering. And, as you might have guessed, he is very vocal about his meatless diet. All in all, a good guy, as aliens go. Dave adores all animals and is confounded that anyone on Earth would think of eating their fellow Earthlings. As the title suggests, he is especially fond of chickens, and he loves to share little facts that show them to be remarkable beings in their own right rather than mere ingredients: they love dust baths, they live up to 11 years old, and they can travel nine miles per hour. Impressive! He points out that chickens are even related to the great Tyrannosaurus Rex! It is hard to argue with Dave’s persuasive arguments, which, notably, are presented in a mainly positive light. Mr. Patiño does not include illustrations of abused animals, aside from one image of a plate of animal products (something that, sadly, children are certainly accustomed to seeing). Nor are there images of battery cages or other upsetting visuals. Indeed, all of the hens depicted in the book are happy ones. That isn’t to say that such images detailing animal exploitation have no place in children’s books; they can and do foster positive discussions. But they are not present here, as this is Patiño’s mode of advocacy – and this positivity works well in his book. The bold colors and the unexpected color combinations are fun and engaging – simple illustrations speak to the author’s background in graphic design. The illustrations are basic enough for a young child to enjoy and understand, and will likely be appreciated by adults as well. Both the words and pictures are quirky and sweet, important ingredients for a compelling children’s book. According to the book jacket, this is the first story in a series. Each new installment will focus on a different species of animal, and why its members should be left off our plates. If these subsequent books are as enjoyable, entertaining, and instructive as Dave Loves Chickens, then readers are in for a treat. Through Mr. Patiño’s work, children will learn that every individual animal lives for his or her own sake, and that each one is just as interesting and deserving of life as humans. I’ve loved books since I was a kid. From being read to by my grandpa every night or reading them myself, to looking at the pictures and getting attached to the characters to the point that I am saddened by finishing the book, I adore the entire experience. It seems this love for reading has been passed on, so these days, pretty much everything I read is kid-friendly and we’re always looking for new, amazing books to introduce to Judah. One of our new favorites is Dave Loves Chickens by Carlos Patino. This is our very first “vegan” book which is really exciting. I love that it gets the point across without being too in-your-face, making it enjoyable for even the non-vegans in our family. Basically, Dave is a monster from another planet. He loves chickens and doesn’t understand why humans eat animals. The wording is simple and to the point, without a crazy build-up or conflict, which I surprisingly love. I wish more children’s books were written this way (with the moral lasting through the entire story as opposed to a “coming to your senses” on the last page). The author, Carlos Patino, is an amazing Graphic Designer so the illustrations really make this book. It has a very Ren and Stimpy (minus the grossness) feel which is super nostalgic for me. But at the same time, it’s so very unique and colorful that Judah loves it as well. From the plot and story line to the illustrations and adoration for the main character, Dave Loves Chickens is hands down one of the most original children’s books I’ve seen. I’ve heard that this won’t be the last of Carlos Patino and Dave, so we will definitely be adding more of his amazing work to our library! I love doing book reviews on books my Veggie Kids and I actually really like! This is one of them. Dave Loves Chickens, written and illustrated by Carlos Patino, is a silly, yet heartfelt, story about a monster/alien dude who may look scary but really “has a heart of gold.” Dave loves chickens (duh) and wonders why we humans eat meat as his diet is meatless. The illustrations are cute but more than that I love the colors. My boys and I giggled while reading this as there were some super silly parts. And of course, I love the message behind it. “Dave Loves Chickens” by Carlos Patiño is a wonderful new Vegan-themed book for kids of all ages. The book introduces Dave, an interplanetary voyager, who doesn’t get why people from earth eat animals. Among Vegan-themed books, Dave’s perspective, as a non-earthling “monster,” is innovative. Our 5-year-old quickly connected with Dave’s persona because, at this age, he loves all manners of smart monsters, superheroes and larger-than-life characters. The parents love the book because Dave is a metaphor for ethical Vegans who sometimes wonder how we arrived among human flesh-eating zombies. As in all good vegan literature for children, Patiño succinctly delivers a breath of detail with just a few words. This is great for younger readers. It helps children grasp and retain the essence of big concepts. It also enables us to layer much more substantive discussion as the kids ask questions, and boy have I been thinking about good responses. For example, “What is pollution?” our son asked. This question has enabled a discussion of how animal-farming produces massive greenhouse gasses that cause global-warming and destroy the earth for everyone. If Netflix streamed “An Inconvenient Truth,” we likely would have watched it this weekend; such is the depth of the teaching moment this book has created. Dave is not the only superhero! Our son has found new ways to relate to chickens. T-Rex has a special place in the imagination of kids; so to relate T-Rex to chickens really elevates their status. As our son said, “they’re cool!” I doubt that carnistic kids would eat chickens if they thought they were cool! In response to chickens dust-bathing: “Ooh, they’re dirty,” he chimed. Well, not exactly. So we spent some time discussing the grooming habits of chickens and segued into pigs wallowing in mud to keep cool. “Yes, like Wilbur at the farm sanctuary,” he added. Score! Our kids make the connections! To say that “Dave Loves Chickens” is a children’s book is like saying graphic novels are for kids; it’s more than a children’s book. Clearly, younger kids connect easily with the illustrations and large custom type, but the book easily appeals to older kids and adults. Most pages are power-point slides that can invite days of discussion; this is the case in our house. To it’s credit, the Vegan-messaging is direct and effective; e.g., “So why is eating them [chickens] not banned?” I can easily see a middle-schooler doing a book report on animal foods that are banned in the US and elsewhere for different reasons. “Dave Loves Chickens” does not fit a storyline narrative. It’s power is in the delivery of kid-sized factoids that invite the reader to explore deeper; such is our experience with explaining pollution and freedom; two of the concepts discussed in the book. True, not all Vegan-themed books need to explicitly mention the word “Vegan” and this book doesn’t. Dave is resolute about his “meatless diet” and he would never eat an animal. So should you buy this book? Yes. The book will generate interest from toddler to teen; certainly, our 5-yo loves it. Kudos to Vegan Publishers for putting out a fine product! Does it get any better than this when it comes to veg books for kids? No. While most kids books sort of major in a fear-based approach or a beat-you-over-the-head-with-pithy-explanations mantra, Dave Loves Chickens shoots straight for the awesome and elevates the animated. Following our main character Dave (who hails from a planet far, far away), through his first Earth experiences and steadfast newfound love for chickens, we learn fun facts about our animal friends which just sort of make it challenging to want to eat them. As a parent, I’m stoked that this is just the first in a series of Dave’s adventures. More books are to come, featuring a variety of commonly-noshed-upon animals. This is for your MIA-and-currently-raising-a-toddler friend. Raising vegan children, whether from birth or just making the transition, can be challenging because we live in such a non-vegan world. You have birthday party menus, school lunches, and getting together with non-vegan friends and family to worry about. Don’t add vegan children literature to the list. Luckily for us, veganism is growing everyday, and with it talented authors and artists using their abilities to influence a new generation of vegans. For my family, I just so happened to make the transition shortly after this book was published. Dave Loves Chickens is a humorous, factual picture book that conveys the message that friends aren’t food and uses age appropriate language and images. The language is simple and easy to understand, making it perfect for my 5 year old to use for reading practice. My kids are quite obsessed with the alien character, which adds a whimsical touch to an important subject. And as a parent, I’m grateful for it’s elementary wording and concepts, making it a quick and meaningful bedtime story. Que bien, me gusta mucho que además de disfrutar de lo que haces, envíes un mensaje a todos los que comemos animales. Pero además, que haya un espacio como VEGAN para hacer más grande el mensaje. Un beso!! Great book. Kids love the illustrations and the cute, educational story. A definite for anyones childrens book store. Is this book only available in the UK, Europe and Australia? Or did I not see the correct button to select? I am uncertain of where you are obtaining your tips, but great topic. I have to take some time figuring out much more or understanding even more. Thanks for fabulous information I have been looking for this information for my goal. Ojo, Naukas, aunque aparece, no moviliza nada y renunciarÃ­a a ser finalista en caso de conseguirlo. BitÃ¡coras deberÃ­a habilitar una lista negra para la gente que no quiere ser votada. Such a great book. I’ve given it as gifts many times and continue to use it for events and kids parties. The illustrations are wonderful, and of course the story is the best.